The end user is often interested in aggregated reporting information, not in separate data items, and SQL pays a lot of attention to this aspect. No one can expect human users to explicitly control concurrency, integrity, consistency, or data type validity. That’s why SQL pays a lot of attention to transactional guaranties, schemas, and referential integrity. Key-Value storage is a very simplistic, but very powerful model. Many techniques that are described below are perfectly applicable to this model. One of the most significant shortcomings of the Key-Value model is a poor applicability to cases that require processing of key ranges. Ordered Key-Value model overcomes this limitation and significantly improves aggregation capabilities. Ordered Key-Value model is very powerful, but it does not provide any framework for value modeling. In general, value modeling can be done by an application, but BigTable-style databases go further and model values as a map-of-maps-of-maps, namely, column families, columns, and timestamped versions. Document databases advance the BigTable model offering two significant improvements. The first one is values with schemes of arbitrary complexity, not just a map-of-maps. The second one is database-managed indexes, at least in some implementations. Full Text Search Engines can be considered a related species in the sense that they also offer flexible schema and automatic indexes. The main difference is that Document database group indexes by field names, as opposed to Search Engines that group indexes by field values. It is also worth noting that some Key-Value stores like Oracle Coherence gradually move towards Document databases via addition of indexes and in-database entry processors. 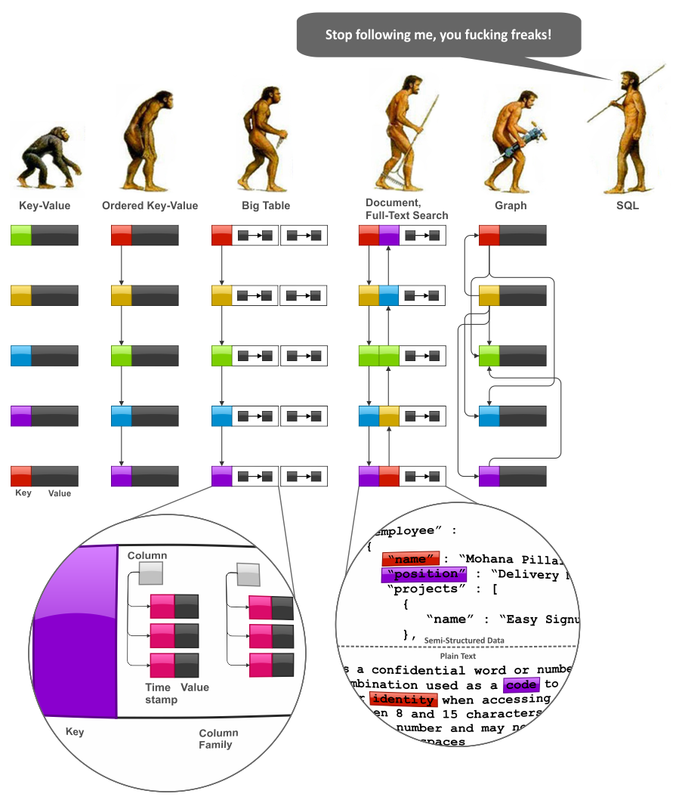 Finally, Graph data models can be considered as a side branch of evolution that origins from the Ordered Key-Value models. Graph databases allow one model business entities very transparently (this depends on that), but hierarchical modeling techniques make other data models very competitive in this area too. Graph databases are related to Document databases because many implementations allow one model a value as a map or document.